The socket had a unusually long life span, lasting 7 years until the last processors supporting it ceased production in 2011. For LGA 775 the distance between the four screw holes for the heatsink is 72 mm, thus such are not interchangeable with ones for sockets LGA 1156, 1155, 1150, 1151, which have a distance of 75 mm. The Prescott and Cedar Mill Pentium 4 cores, as well as the Smithfield and Presler Pentium D cores, used the LGA 775 socket. In July 2006, Intel released the desktop processor Core 2 Duo (codenamed Conroe), which also uses this socket, as does the subsequent Core 2 Quad. Intel changed from Socket 478 to LGA 775 because the new pin type offers better power distribution to the processor, allowing the front-side bus to be raised to 1600 MT/s. The 'T' in Socket T was derived from the now cancelled Tejas core, which was to replace the Prescott core. Another advantage for Intel with this newer architecture is that it is now the motherboard which has the pins, rather than the CPU, transferring the risk of pins being bent from the CPU to the motherboard. The CPU is pressed into place by a "load plate", rather than human fingers directly. The installer lifts the hinged "load plate", inserts the processor, closes the load plate over the top of the processor, and pushes down a locking lever. The pressure of the locking lever on the load plate clamps the processor's 775 copper contact points firmly down onto the socket's 775 pins, ensuring a good connection. 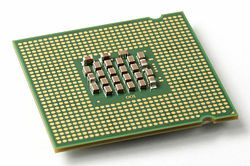 The load plate only covers the edges of the top surface of the CPU (integrated heat spreader). The center is free to make contact with the cooling device placed on top of the CPU. The spacing for the CPU cooler mounting holes is 72mm x 72mm. An examination of the relevant Intel data sheets shows that LGA 775 which is used for consumer level desktops and LGA 771 used for (Xeon based) intel workstation and server class computers appear to differ only in the placement of the indexing notches and the swap of two address pins. Many pins devoted to functions such as interfacing multiple CPUs are not clearly defined in the LGA 775 specifications, but from the information available appear to be consistent with those of LGA 771. Considering that LGA 775 predated LGA 771 by nearly a year and a half, it would seem that LGA 771 was adapted from LGA 775 rather than the other way around. In fact, using an adapter does allow LGA 771 processors to be used with LGA 775 motherboards. The force from the load plate ensures that the processor is completely level, giving the CPU's upper surface optimal contact with the heat sink or cold-water block fixed onto the top of the CPU to carry away the heat generated by the CPU. This socket also introduces a new method of connecting the heat dissipation interface to the chip surface and motherboard. With LGA 775, the heat dissipation interface is connected directly to the motherboard on four points, compared with the two connections of the Socket 370 and the "clamshell" four-point connection of the Socket 478. This was done to avoid the reputed danger of the heat sinks/fans of pre-built computers falling off in transit. LGA 775 was announced to have better heat dissipation properties than the Socket 478 it was designed to replace, but the Prescott core CPUs (in their early incarnations) ran much hotter than the previous Northwood-core Pentium 4 CPUs, and this initially neutralized the benefits of better heat transfer. However, modern Core 2 processors run at much lower temperatures than the Prescott CPUs they replace. All LGA 775 processors have the following mechanical maximum load limits which should not be exceeded during heat sink assembly, shipping conditions, or standard use. Load above those limits could crack the processor die and make it unusable. The transition to the LGA packaging has lowered those load limits, which are smaller than the load limits of Socket 478 processors but they are bigger than Socket 370, Socket 423 and Socket A processors, which were fragile. They are large enough to ensure that processors will not crack. Compatibility is quite variable, as earlier chipsets (Intel 915 and below) tend to support only single core Netburst Pentium 4 and Celeron CPUs at an FSB of 533/800 MT/s. Intermediate chipsets (e.g. Intel 945) commonly support both single core Pentium 4-based CPUs as well as dual core Pentium D processors. Some 945 chipset-based motherboards could be given a BIOS upgrade to support 65nm Core-based CPUs. For other chipsets, it also varies, as LGA 775 CPU support is a complicated mixture of chipset capability, voltage regulator limitations and BIOS support. Wikimedia Commons has media related to Socket 775. ^ "Intel Pentium 4 Datasheet" (PDF). Archived from the original (PDF) on February 24, 2008. ^ "New P4 Socket Type LGA 775 (Socket T)". asisupport.com. Archived from the original on December 13, 2007. Retrieved 2007-03-14. ^ "Socket 775 / Socket LGA775 / Socket T". CPU World. Retrieved October 1, 2015. ^ "Intel Pentium 4 Processor on 90 nm Process in the 775-land LGA package - Thermal and Mechanical Design Guidelines" (PDF). intel.com. Retrieved 2 May 2017. ^ "[MOD] LGA775 Support For LGA771 Xeon CPUs". Overclock.net. Retrieved March 23, 2015. ^ "ASRock > Motherboard Series". ASRock. Archived from the original on 15 March 2015. Retrieved 15 March 2015.